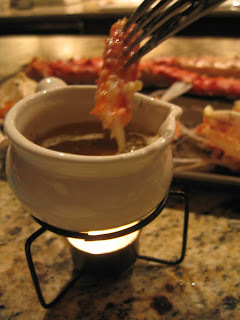 What better way to pass another cold night in Chicago than with some fresh crab legs? Here is a simple addition for a fun butter to go with your crab. First, I baked my legs. Simple preheat the oven to 400 degrees, place the crab legs on a baking pan, add a little water and bake for about 10 to 15 minutes. 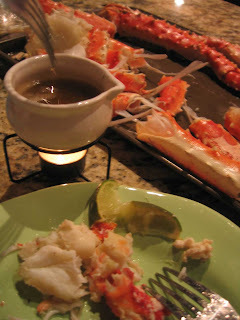 You can check the top of the crab, when it opaque white and flaky it's ready. While the crab is cooking, place one stick of butter in a small pan on the stove, keep the flame on low to avoid burning the butter. Add 1 tsp garlic powder and 2 tsps of dried thyme. Let that become melty. When your crab is ready, try using a lime instead of a lemon, it's goes nicely with the thyme butter. While your licking the butter dripping off your fingers, don't forget to be fat and happy!